Today, I opened a Baci chocolate that said, on the little slip of paper wrapped snugly around it, “Love can hope where reason would despair.” Heckle me all you want, but I love to indulge in fortune cookies, horoscopes, messages from sidewalk graffiti, ghostly superstition, and the mysterious shapes of clouds at opportune moments. 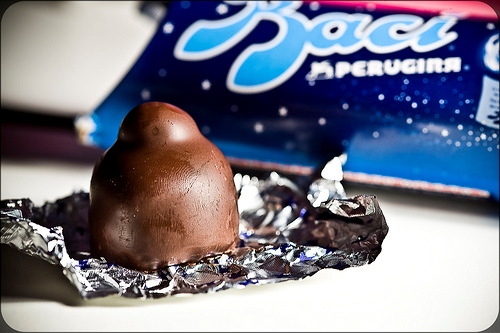 And because of these guilty pleasures, I believe that little Baci chocolate is a startlingly accurate summary of the past year, and a good projection of what’s to come. 2011 has shown me that logic, reality, finance, and reason take a backseat when passion is driving you. This is the mentality that I always want to carry with me. With the close of 2011 comes a feeling of relief and anticipation. This year has felt like what I often refer to as a “buffer” book in a series – the one needed to explain backstories, flesh out ideas or plans, tie up loose ends, and set up the drama for the final book. Think Half-Blood Prince, or Catching Fire. So much has happened this year! There were many downs, but many more ups. The good points shine out in my memory, vivid and sharp, a slow-motion mélange of images – graduating from university, completing a post-grad program and a publishing internship, living downtown, midnight dinners, friendships made, plans laid, good nights, new sights, New York City. It all feels so long ago, and just like yesterday, at the same time. My friend, Ikhlas, wrote a precise and beautiful blog post on the question many of us hate to answer — “What is it that you do?” She lists seamstress, artist, and magician. I’ll add another of my own to the list: dreamer. All of my dreams come true in my imagination…and on paper. The most concrete things I learned this past year, in school and in life, have been about myself. I want to write. I want to travel more. I’m looking forward to 2012…something tells me it’s going to be a fantastic, scary year. But all things beautiful are equally terrifying. When I asked my dad if he thought the world would end next year, he replied, “It already has. Everyone’s living for the wrong reasons.” How right he is. I feel little worry about Nostradamus/Mayan predictions – that’s one prophechy I don’t subscribe to. The Earth is stronger than any of us. Though our own society may be crumbling, the world is just fine. It’s the people that need to change. It’s us that need to understand the universe we live in, and all the ones that we create. Here’s to life, love, happiness, and doing it all for the right reasons.